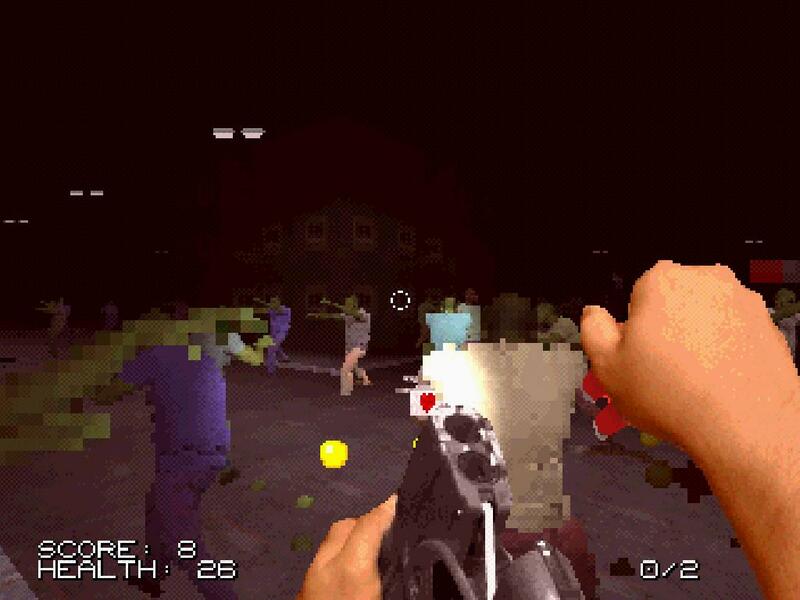 Playable in your web browser of choice, Shambles is a traditional 90s-styled first-person shooter where the goal is to kill as many things as possible. Like most shooters, obviously. In Shambles, you’re witnessing that first moment when the zombies burst out from wherever they’re hiding and start eating the other living things. Day Zero. Contrary to popular belief, the army won’t save you. No, in a situation such as this, society will implode spectacularly. But that’s alright, because the world outside is still fine. You can play out your zombie murder spree fantasies from the comfort of your own bunker, safe in the knowledge that you’re still going to hell because virtual murder is apparently still murder. The goal, ultimately, is to survive as long as possible and achieve the highest score you can. But this game, well, it’s a shambles. You’re just one person trapped in a mish-mash of zombies, soldiers and innocents. There’s no escape; this game goes on until you’re killed. You are trapped in there, among murderous instinct-driven monsters…and zombies and civilians, too. Being a relatively simple game, the depth comes from the limited ammunition and the fast-paced gameplay. Feverishly difficult but legitimately addicting, Shambles is a marvelous polyfill for those short gaps where you can squish a little gaming into your schedule. The more you practice at Shambles, the better you get at slipping past the zombies and soldiers to make a quick getaway. Shambles has an ugly, dithered low-quality GIF image feel to the graphics. And I love it for that. I’d say the visuals are reminiscent of Doom and Rise of the Triad. 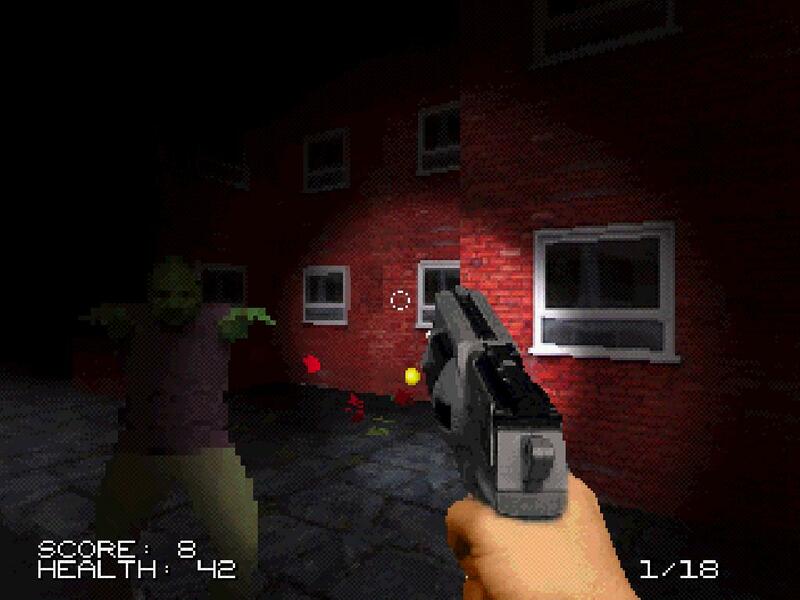 Shambles basically is Doom, but with more enemies, less weapons and a lot more pressure. Oh, and incredibly basic level design, but Shambles doesn’t need stairwells, elevators and warp tiles. Actually, I think pressure is the word I was looking for. I’m under a lot of pressure in Shambles. I’m constantly watching my ammo counter, meanwhile trying to keep an eye on the zombies and soldiers coming my way. Run out of ammo, and you’re stuck with just your bare hands. You had better hope your left hook is up to scratch. The number of enemies means I often find myself caught in a crowd, and that’s when things get so much harder. If you’re clogged up in the crowd, you’re dead. No two ways about it, I’m afraid. I have to spy out those small gaps between enemies and dash through hoping to get that moment of respite before being thrown down the next street. What’s down the next street? More soldiers that want me dead and more zombies that want to eat me. I admire that each group of enemies are fighting each other—soldiers are killing both zombies and civilians, for instance. The whole situation is a shambles—once again, a fantastic choice of name for this game. You’d like to think that in a zombie outbreak situation everything would be running a bit smoother, but Shambles tells it like it is. In such a situation, society would break down into a bloodbath. 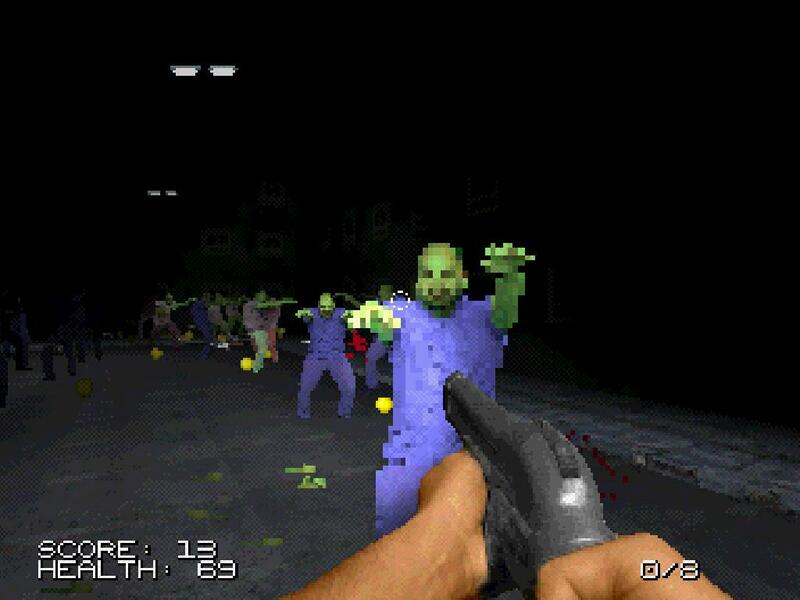 Eventually, the only enemies are zombies. The transition starts off slow, but ultimately speeds up before you even notice it. After that, there are no more health packs or ammunition; zombies only drop points. It’s time to go out in style, clinging desperately to life. How naive of you. For a quick gaming fix, a high level of challenge and a nostalgic feeling, Shambles is the time wasting activity you’ve been seeking. Free to play online, and downloadable standalone for Windows, Shambles is a fantastic and grotesque piece of frantic joy.